Who profits from innovation? Startups or incumbents? The idea that only startups can innovate and that incumbents can’t respond is wrong. Apple, obviously no longer a startup, is quick to respond to innovation: just yesterday they put a score of startups out of business with innovative products. Apple was not the innovator, but the products were innovative all the same. And not just Apple: Google, Amazon. These are non-startups that appreciate innovation and make money from it. Not that this–big companies profiting from innovation–is in itself new. Big, established, well-managed businesses have always profited from innovation, even when they are not really innovators themselves. Looking hard at what’s already working in the marketplace is the tactic likely to produce the quickest results. I call this robbing a few gas stations so that you don’t starve to death while you’re planning the perfect crime. Lots of companies think that the only good innovations are the ones they develop themselves, not the ideas they get from smaller competitors–the familiar not-invented-here syndrome. In my experience, the opposite is usually true. Normally, outside ideas are useful simply because your competitors are already doing your market research for you. They’re proving what customers want in the marketplace, where it counts. I’ve found that good ideas come from all over–conventional competitors, regionals, small companies, even international competitors in Europe and Japan. So it may not surprise you to learn that most of PepsiCo’s major strategic successes are ideas we borrowed from the marketplace–often from small regional or local competitors. For example, Doritos, Tostitos, and Sabritos (whose combined sales total roughly $1 billion) were products developed by three small chippers on the West Coast. The idea for pan pizza (a $500 million business for Kansas-based Pizza Hut) originated with several local pizzerias in Chicago. And the pattern for Wilson 1200 golf clubs (the most successful new club line ever) came from a small, golf clubber in Arizona. In each case, PepsiCo spotted a promising new idea, improved on it, and then out-executed the competition. To some people this sounds like copycatting. To me it amounts to finding out what’s working with consumers, improving on the concept, then getting more out of it. You can decide how much this idea appeals to you. But at PepsiCo it led to $2 billion to $3 billion worth of successful innovations. And without those innovations, the company’s growth would have been a lot less dynamic. The only surprising thing about what he’s saying here is that he said it out loud. This is a rational big-company dynamic. When companies that once prided themselves on their unparalleled willingness to think different start to feel the heat of the quarterly earnings target, they get “tough-minded” and figure out how to profit from innovation no matter where it comes from. Why wouldn’t they? Who Profits, Innovator or Incumbent? The startup crowd invokes the magical specialness of startups as innovators and the bloated battleship-turningness of established companies while big-company executives and management consultants believe that first-mover advantage is a fairy tale for dreamers. Back in the 1990s I worked for a Fortune 500 company, pushing them to invest in startups. One of the senior executives there loved to say “you can always tell the pioneers: they’re the ones with the arrows in their backs.” He said it pretty much every time I was in pretty much any meeting with him. At the time I could not articulate why, though he was sometimes right, he was also sometimes wrong. There are innovators who prosper and there are innovators who get crushed by non-innovative incumbents. Being the innovator, in itself, evidently does not guarantee that you will make money from your innovation. And neither does being smart, being fast, being agile, being lean, being customer responsive, having a better UI, “getting it”, or any of the other reasons usually spouted around. What, then, does determine it? There are two main things that determine who profits from your innovation: you or someone else2. The first is: how hard is it to replicate your innovation? The second is: what do the complementary assets your business model requires look like and how important are they to the commercialization of your innovation? First, can someone replicate your technology. Things like patents, trade secrets, and regulation make it hard or illegal for another company to do so, of course. But we know these things only benefit incumbents, not startups. Factors more common in the startup world that make an innovation hard to replicate include network effects, cutting-edge technology or a very limited supply of engineers who know how to implement the technology, and user switching costs. Second: complementary assets. These are the things you need besides the technology to make your business model work: distribution channels, manufacturing capabilities, the use of someone else’s platform (the cell phone network, the banking network, Facebook. ), etc. Some complementary assets are critical to your success (you can’t introduce the iPhone without a cell network) and you benefit more from them than the owner of the asset. Some are less critical (it would be great to partner with utility companies to offer rebates on your new smart thermostat, but you could make a go of it without them) and, assuming your innovation is valuable, the owner of the asset probably benefits more than you do. This last part–who benefits more?–does not mean who makes more money, it means who would be worse off if the other did not exist. It also applies per asset owner; per bargaining unit. So Airbnb’s complementary assets are apartments their owners are willing to rent. While Airbnb certainly benefits more from the existence of these apartments generally, each individual apartment owner benefits more from Airbnb than Airbnb does from them. All companies need complementary assets, but some complementary assets are generic. By this I mean that your startup can’t be blocked from using them. The Internet is a complementary asset to Twitter, but so long as we have Net Neutrality we can assume that startups will not be blocked from using it; it is a generic complementary asset. Once you figure out the answer to these two questions, you can decide the best strategy for your startup. Let’s apply this to some examples. Most complementary assets are owned by some large firm. 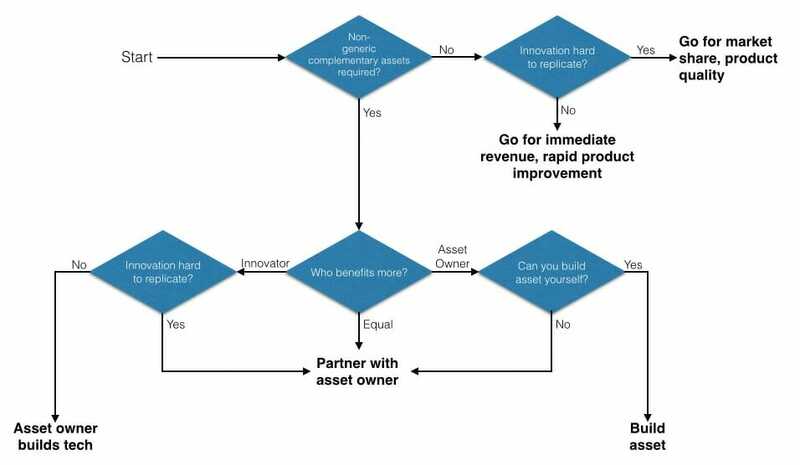 When the innovation is valuable in itself (so, more valuable than the complementary assets) but is also easy to replicate, the large firm owner of the asset is better served by replicating the innovation and rolling it out themselves. And this is what they do. This is why Pebble is screwed. When the owner of critical complementary assets decides to compete with you, you’ve got trouble. It doesn’t mean you disappear entirely–TweetDeck still exists–it just means you’ve got to compete to survive. That’s the worst outcome here. The best outcome is when you have an innovation that’s hard to replicate and needs only generic complementary assets. Then you don’t need to divvy up the value created with any partners and you can count on not having to compete for a while. When that’s the case you can spend your early years getting as large as you can, knowing you can always turn on the revenue later. That’s the best place to be. Facebook, notably, does not seem to operate in the hard-nosed way strategy would dictate. As the owner of a major complementary asset, they should be replicating innovations far more often than they do. That they don’t is a boon to entrepreneurs trying to sell their companies to them, but not one I expect to last. As Chris Dixon has written, many startups today are becoming “full-stack startups.” The reason this is happening more today than before is that innovations are becoming easier to replicate as the major technologies they are built on are aging. At the same time, the few niches where only generic complementary assets are required have filled up. You are left with opportunities that require either partnering with the owners of complementary assets or building those assets yourself. When you build the assets yourself, you’re a full-stack startup. This is a bad strategy for the entrepreneur. Being an expert at your innovation is one thing; being an expert at that and also at operating the complementary assets is another. Building complementary assets also requires money, often a lot of it. Both of these things are okay for the venture capitalist: they like to invest money and can always swap in new talent when it’s needed. But for the entrepreneur that means dilution and being replaced. The best way to counteract this is to look for innovative ideas that take advantage of new technologies. These are more likely to be difficult to replicate and to have more opportunities to build something with no or few complementary assets. If you’re evaluating startup ideas or are early in your company’s life, it pays to figure out which strategy applies to you and whether you can change your idea to one with a more promising strategy. It’s nice to be remembered as an innovator, but it’s nicer to be remembered as a success. Great post on strategy. Thanks for sharing. Great post, but in terms of “easy to replicate” this focuses only on products, despite the brief mention of network effects. Arguably, Uber, Airbnb and the like are hard to replicate, not necessarily in the product but in the platform. The same way that at this point what’s hard to replicate about Twitter isn’t necessarily the technology as much as the 350+ million people on it. Most notably for the online/offline platforms (meaning online platform, offline service), what’s hard to replicate is building the trust with and among their users, especially when new behaviors are involved. Could you imagine a company like Hyatt successfully replicating Airbnb’s community? I think something like Uber could be done by a major company with enough $$ (i.e., a lot), because the whole get in a cab/drive people around for money behavior isn’t new. But mainstream customers renting out apartments from strangers all over the globe is new. I don’t mean it to apply to only products. When I say technology, I include any type of technology, whether it’s a physical technology, an algorithm, a business model, a sales technique, whatever. A technology is something that turns things of lesser value into things of greater value, whatever that process or inputs are. An innovation is a change in a technology. When I say ‘hard to replicate’ I don’t mean it in the literal sense. I didn’t want to sound overly academic, but what I meant was that replicating the technology would not be profitable. A patent makes technology very easy to replicate: you have the recipe on paper right in front of you, but if you replicate it, you get sued. Similarly, it’s easy to replicate Twitter’s platform and plenty of people have, but you can’t replicate the network, as you note. I agree that building a brand is sometimes useful, sometimes necessary. I would consider a brand a complementary asset. I could indeed imagine Hyatt building Airbnb’s community. I think that if Hyatt were able to get higher prices for Airbnb-type living spaces, many of Airbnb’s hosts would switch. Hyatt has a great brand. And I think that for the mainstream consumer (and Airbnb is becoming pretty mainstream) Hyatt is a more trusted brand than Airbnb. I could also imagine an Airbnb competitor starting and licensing Hyatt’s (or someone’s) brand as a complementary asset. Managing their brand is something Airbnb works very hard at, and something that will be a major concern of theirs for years to come.